Looking at the home page I notice that the Gala theme this year is boots and shoes and this stirs old memories. Quite often though, I see Maybole being described as a small market town in South Ayrshire which in my time, during the nineteen thirties and forties, is or I should say was, only partially true. At that time it was quite the bustling metropolis, if only a small one, what with footwear factories, tanneries, agricultural implement manufacturing, the railway and a very robust commercial/merchant infrastructure. Of course, the agricultural industry surrounding the town always played a huge part. My very first job on leaving school in the forties was with John Lees Boot and Shoe factory. I can still remember how I approached the office of Alex Lees with a great deal of trepidation for a job interview. Mr. Lees asked me a few questions then as a final question he asked me the Latin name for a farmer which took me by surprise, however, having just left Carrick Academy I still retained a few remnants of what they taught me, or tried to, so I was able to furnish him with the right answer. Anyway, he must have been satisfied with with me as he instructed me to start work on the following Monday. I started working in the general office and recall sitting at what seemed to me to be a very high desk on a very high stool but I think that was just a matter of optics at that time as I was rather short in stature, still am. As time progressed I took over office printing responsibilities from co-worker Jimmy Heron who was moving on to bigger and better things, with another company. This was in addition to my regular duties which also included taking an empty syphon on a sack barrow down to Boyd’s the chemist once a week to be replenished with soda water. When the syphon was re-filled I had to trundle it back up to the residence where Mrs. Lees, Alex’s mother, showed me where to put it. All in all the job was educational and quite often I was dispatched hither an yon throughout the factory for this reason or that, which gave me good insight into how the various parts of the footwear were put together and combined into wearable units. 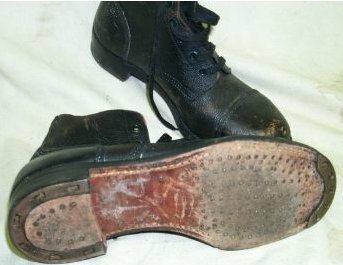 Many of the boots had tackets in the soles with heel and toe plates, they were great for sliding on the ice during the winter, much to the consternation of our parents, as that exercise soon demolished the tackets or hobnails. Some footwear contained sparables (headless nails) on the soles and heels, those were probably for people not wishing to slide in the winter. During the war, Lees also manufactured boots for the military, especially jungle boots for the troops fighting in Burma. Much as I enjoyed the sights and sounds and smells of the boot and shoe manufacturing, and the daily hike up Kirkland Street, the Red Brae and over the Townend Brig, like Jimmy Heron I also moved on to bigger and better things, the London Midland and Scottish Railway. 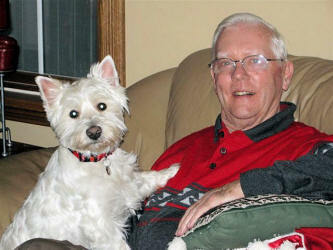 Jim McAlpine with Skye. Jim is now living in Ontario, Canada. Do you remember this Cairn School tune?